This hole offers a breathtaking view of the community. 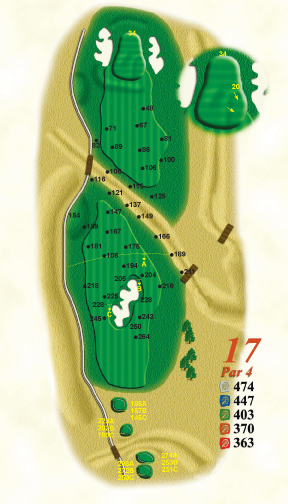 Aim your tee shot at the set of bunkers to the right and utilize the prevailing wind. Finding the fairway off the tee is a must. The second shot will generally play a little shorter. The downhill tee shot requires a long to mid iron aimed down the left side of the fairway as balls will kick to the right. Long tee shots may find the creek/pond at the end of the fairway. The relatively short second shot is played to a two-tiered green that is guarded by a pond on the left and a gaping bunker on the right. 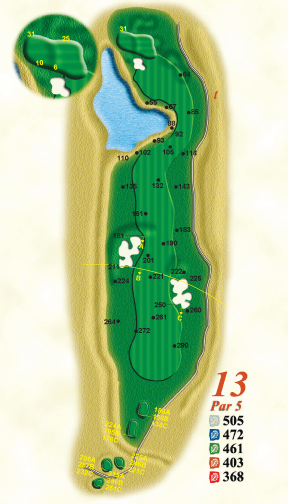 A good short iron player can make birdie here. There is a little bit more green surface than it looks from the tee. The three-tiered green will be very quick from back to front. Placing the ball on the correct tier is key. If the hole is positioned on the front level, use less club to avoid being past the hole. Take your three and move on. 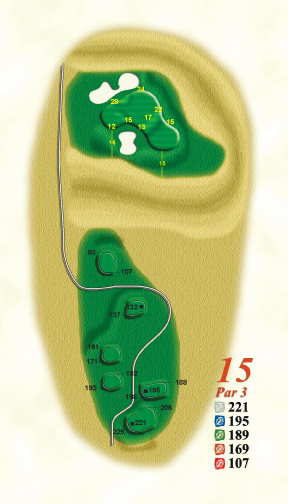 Perhaps one of the most difficult holes on the backside of the course. From the tee, aim your tee shot at the center of the fairway and make a confident swing. From the fairway, take an extra club or two to reach the hidden putting surface as the entire hole is more uphill than it looks. This green is very subtle so be careful-putts are quick from front to back. Our signature hole…look at the view. 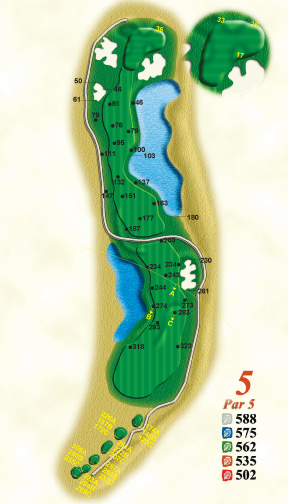 This is a true three-shot Par 5 for most. Aim your tee shot just left of the fairway bunker. 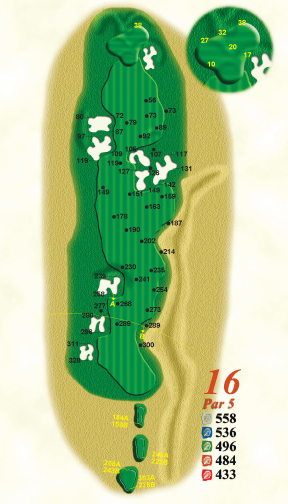 Unless you are close to the fairway bunker, your second shot should be played to the 150 mark to avoid catching the looming water that cuts into the fairway at 125 yards from the green. 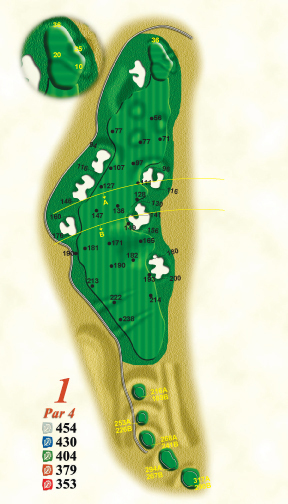 This large green has many subtleties so pay close attention to the slopes. Par is a wonderful score. The prevailing wind may be in your face so take enough club. 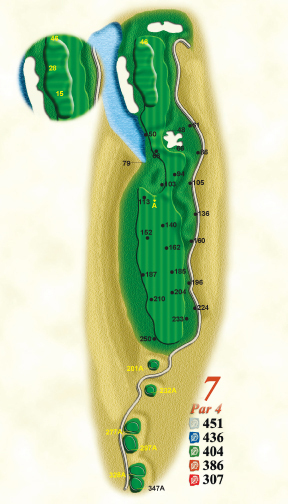 The smart player will aim his shot at the right side of the green as everything slopes left. Avoid the left bunker as it does present a challenge. This hole is made a little easier by the elevation change but is visually intimidating off the tee. There is much more room in the fairway so aim your tee shot at the fairway bunker in the distance on the right. 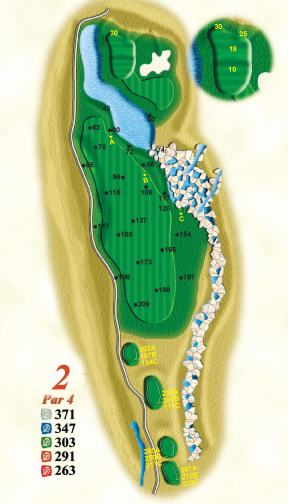 Most balls will bounce right and leave a second shot to the narrowest green on the course. It will be better to stay to the right on this hole. What looks like a straight forward hole can bite you. Use more club when the wind is in your face and favor the right side. 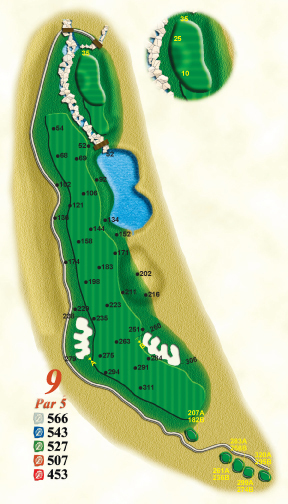 The left side is framed by barranca and the left bunkers will catch balls that are a little short and left. A good drive should be aimed at the left fairway bunker in the distance since most players can’t reach it from the tee. On the second shot, the further up the fairway you go, the narrow it gets. Try and lay up to 100 yards for a scoring opportunity on this small green. Don’t be too aggressive with your third shot to the smallish green. On your tee shot, favor the left portion of the fairway. Your second shot will be played to an elevated table top green. Use enough club as shots that are short make for a difficult up and down. With an ample amount of room off the tee, bear down and hit a solid tee shot to this “bunkerless” hole. Plenty of challenges await your second shot that requires an exacting club selection. 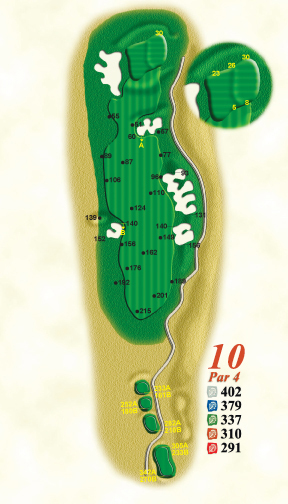 Use your short game creativity around the green as Mr. Kite has given us many options here. 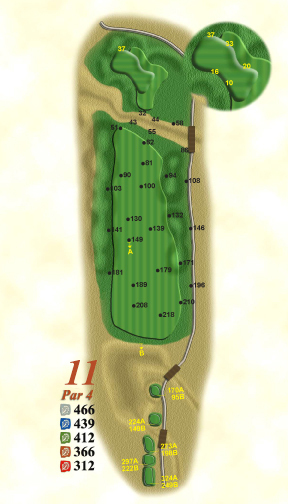 Here, the tee shot is the key to taking advantage of a somewhat reachable par 5. A good drive between the bunkers leaves a risk/reward “opportunity”. Hitting this green in 2 still requires a great deal of creativity if you are to leave this hole with a birdie. 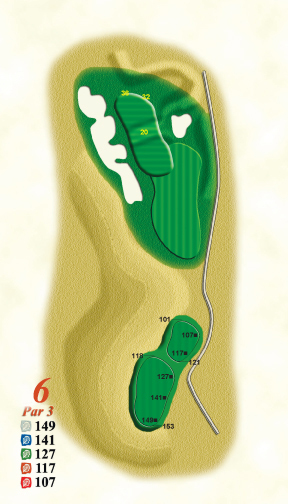 One of the favorite holes on the back side…a ridge divides the fairway in two levels. The two fairway bunkers on the right are good targets off the tee as there is a bit more room to the right than you see. Use less club on your approach as it is very easy to wind up on the wrong level of this two tiered green. Appropriately named for the unique rock outcropping in the distance. Don’t let the length intimidate you. It plays much shorter, yet is very exacting. 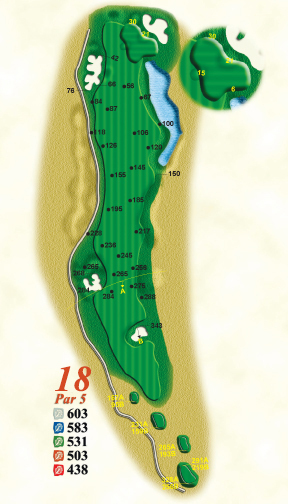 The wind direction is normally at your back and the green will hold a solidly struck tee shot. Visually deceiving. A true three shot hole with much more room off the tee than it appears. 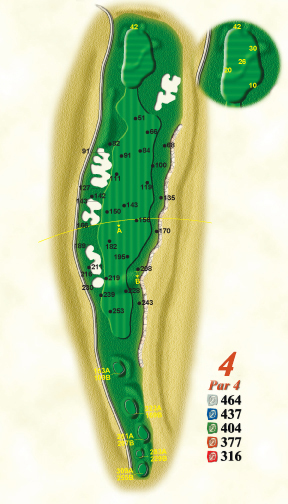 Be wary of the right side and aim down the left for position-most tee shots do bounce right. The second shot is best placed in the 150 yard range from the green as this is where the most room exists. Use an extra club on your third shot as it plays much more uphill than it might appear. Par is a great score. Avoid the fairway bunker at all cost. The left side is much friendlier than the right and most shots will kick right if played down the left side. 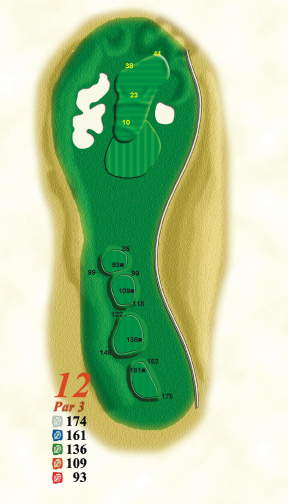 The second shot will usually require a shot that favors the left side of the putting surface. 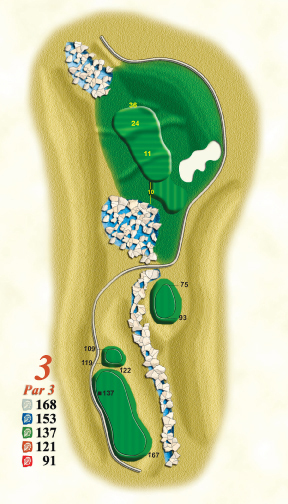 A creative short game may help you leave here with par. 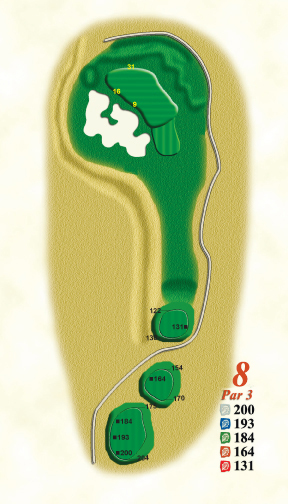 The ninth hole offers a great opportunity to settle the score on the front side. A solidly struck tee shot will be aimed just left of the right fairway bunker where you should receive the benefit of a down hill fairway from there. There is plenty of room to position your second shot. The longer player might even be able to chase a ball on this green in two. 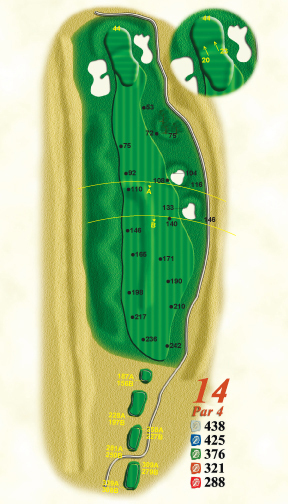 The yardages usually play a little less because of the change in elevation.